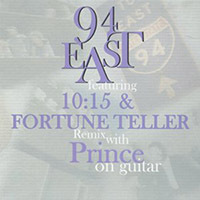 94 East (full title 94 East Featuring 10:15 & Fortune Teller Remix With Prince On Guitar) is a collection of previously-unreleased studio recordings by 94 East. The collection contained two previously-unreleased songs recorded in late 1976 or early 1977 with Prince on guitar, 10:15 and Fortune Teller, although the original tracks had been updated for release (leaving Prince's contribution untouched, however). Prince had no input into the final release, however, and was upset at its release (especially the prominent use of his name on the cover), leading to the threat of a lawsuit against Pepé Willie upon its release. No lawsuit was ever filed, however. Prince's contributions to 10:15 and Fortune Teller were recorded in late 1976 or early 1977 at Sound 80 while Prince also worked on his own tracks. The two tracks with Prince on guitar were intended for a single by 94 East for Polydor Records, but this release never came to pass. The recording session did not go well, as Hank Cosby was not interested in Prince's ideas for the tracks. The remainder of the tracks on the album are thought to have been recorded in 2001 or 2002, but this has not been confirmed. The collection was only available through Pepé Willie's website, www.pepemusic.com. The album was released without much promotion, and did not chart. The collection was only available through Pepé Willie's website, www.pepemusic.com. 1 Written by Pepé Willie. This page was last modified on 10 October 2017, at 23:39.